Eric Swanson has been a prominent orchestral, commercial and recording bass trombonist in the Dallas Ft. Worth area for more than 30 years. He has performed as the bass trombonist with the Dallas Opera Orchestra for more than twenty of those years, and his numerous performance credits include names like Sinatra, Woody Herman and Ella Fitzgerald. 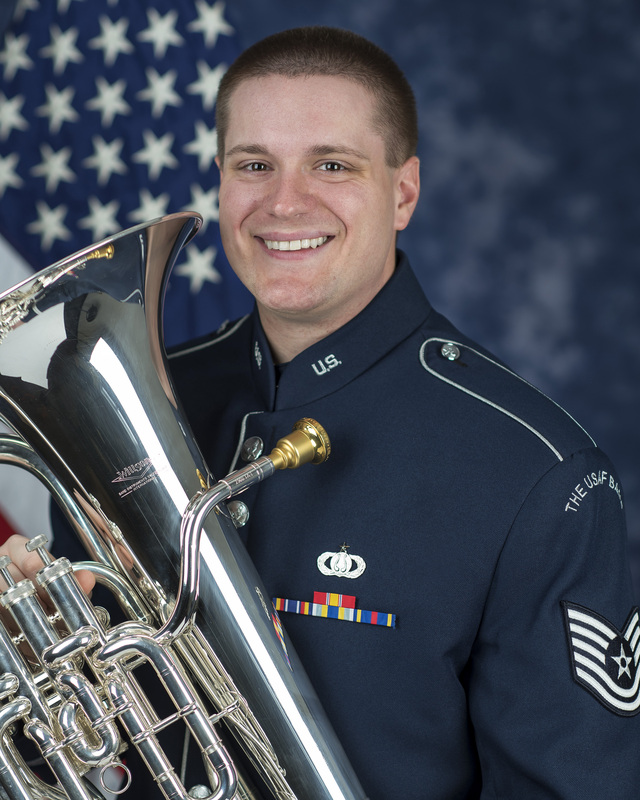 Along the way, Eric discovered and fostered a talent in instrument repair and has gained an excellent reputation. Mr. Swanson is in the enviable position of having owned and played some of the finest bass trombones ever produced, and is the developer of a superb solotone mute for bass trombone. We are honored to have Eric Swanson join us for the second installment of The Craftsmen’s Bench. The Bach 50 is probably the most popular and influential bass trombone, why? 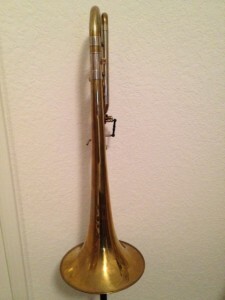 The Conn 70H bass trombone was very popular from the 1920s through the 1950s, and the Conn 72H after that. 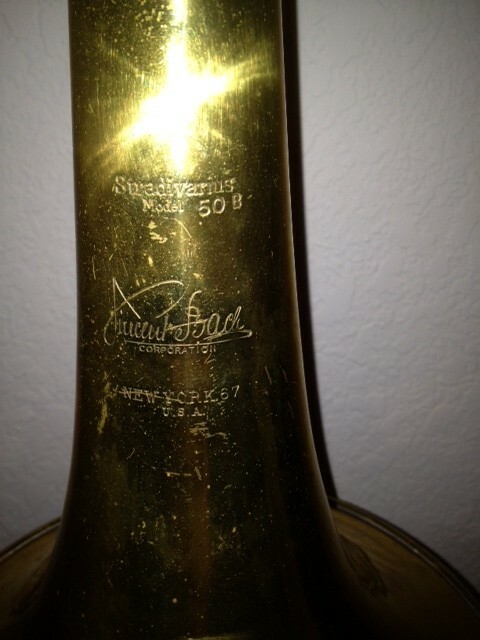 The Bach 50B was a larger trombone from the tuning slide through the bell (although both bells ended up 9.5 inches). I think it just has a bigger, fatter sound than the Conn 70 series horns. The Conn 60H and 62H models came out in the late 1960s and were more similar in size to the Bach, and quickly became very popular horns with most players. When Conn went downhill after the factory moved to Abilene, Bach started to really regain their popularity. My personal feelings are that the Bach has a more organic sound and feel, like it is part of the player. The newer horns, Yamaha, Edwards, Shires, Getzen, and others, just don’t seem like they are part of me like the Bach does. What makes Bach Mt. Vernon trombones so special? I don’t think anyone really knows. I guess the fact that they are scarce makes them valuable. It could be that the ones that survive today were probably ones that were taken care of, for the most part played by professionals and hand picked back when they were new. I’m sure there were some dogs made back then too, possibly they didn’t survive. Also, they weren’t producing the large numbers of instruments back then that they do now, so Bach back then was more like Shires or another smaller operation is today. Has anyone come close to replicating that sound? I think you could find a really good new Bach today if you tried out a bunch of them until you found the one that was right for you. In other words, I think they still make good horns today. I have played a Shires bass that I thought played great and would have bought if I needed a horn. I like the Yamaha bass and their jazz horns, they play great but don’t have the sound quality of the old Bachs and Conns, but if I needed a horn today and didn’t have the luxury of trying out dozen of horns I would probably buy one and be pretty happy with it. I’ve played a few Edwards basses that I could easily play in place of my Bach. The sound might not be exactly the same, but I would get used to it with no problem. What is the best bass trombone you have played? People seem to think the Mt. Vernon Bach Trombones are the greatest. My personal favorite is a New York Bach, but I have a Mount Vernon which plays very well. Charlie Vernon also plays a New York Bach Bass Trombone. He thought he had the only one until I told him I have two and my friend Jason has one also. He couldn’t believe it! Although I have not seen a Mount Vernon 9″ bell. I have a New York 9″ bell, which was the standard size at one time. My parents are both musicians. My dad was a band director, tubist, and the principal string bassist in the Springfield, Missouri Symphony for many years. Mom was an elementary music teacher and church choir director. I had both parents as teachers from about 3rd through 7th grade. My dad had a trombone in the closet, so he let me start on that in 4th grade. I added tuba in 7th grade, and euphonium in high school. I started playing bass trombone in college at the University of North Texas (UNT), but I have always continued to play tenor trombone as well. I would say that my dad was one of my heroes for sure. Later, in high school I discovered albums by Urbie Green and Bill Watrous. In college, I was turned on to Rosolino and Fontana which I listen to all the time hoping a tiny bit of what they could do will rub off on me. What have been some of your most memorable moments in music? Well, there have been so many. I have had a 33 year career as a professional trombone and tuba player so far. I have really enjoyed my 23 years with the Dallas Opera Orchestra on bass trombone, especially performing the Wagner operas. I have gotten to sub in the Dallas Symphony many times, and been lucky enough to have recorded four albums with them. And I especially enjoyed playing with Ella Fitzgerald, Frank Sinatra, Mel Torme, and some of the other great singers. How did you become involved with instrument repairs? I played around with it in high school. A friend and I used a butane torch and some $20 pawn shop trombones to make a couple of alto trombones because there were no cheap altos back in those days. Then, at the UNT, I took a repair class for one semester and kind of excelled at it. We had a man in Irving, TX back then named Howard Ward that everyone took their horns to (woodwind and brass players), who was the best repair technician around. He always worked on my slides, and I mentioned that I was taking the repair course and showed him a soprano trombone that I built. He told me I could come apprentice with him if I need a job sometime and I ended up giving him a call a little later. What are your favorite repairs/projects? I am most proud of a contrabass trombone that I built, a cimbasso, and two tubas that I made. One tuba is made of leftover parts from three different tubas and plays great. The other is a King BBb with a 1909 Holton Eb bell that turned our very well. 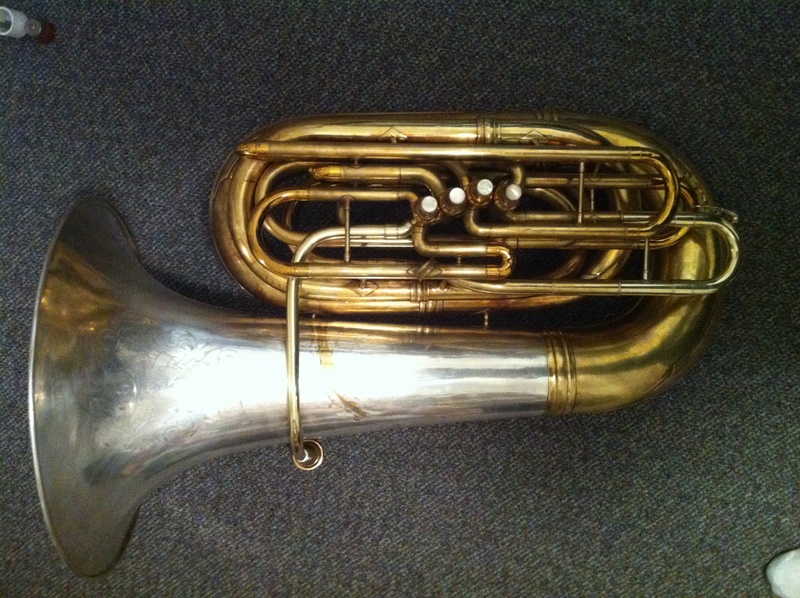 I am also very proud of a tuba that I managed to repair that had been run over by a car. What innovations do you feel you have brought to your craft? I don’t know if there is anything that has been an innovation. I just try to do good solid repair work that looks good. So many repair techs do such horribly sloppy work, I just can’t believe they actually charge money for it. I was taught by Mr. Ward to prepare the joint properly, solder it neatly, buff off any extra solder so it looks nice, stuff like that. Just good basic repair techniques that everyone should be doing, but don’t always. I sort of followed in the footsteps of Larry Minick, whom I never met but talked to on the phone a couple times. He really started the whole bass trombone customizing business. He was the first one that I know of that took stock bass trombones and moved the valves in-line. Before him, there really was no such thing as an in-line valve bass trombone. He pretty much came up with the idea of open-wrapped F-attachments, independent triggers—-all things we take for granted on bass trombones today. I started doing all that stuff in the Dallas area in the early 1980s so guys wouldn’t have to send their horns to L.A.
could come up with a functioning solotone for bass trombone. Well, the prototype turned out to play very well and we were both happy with it so I made one for myself too. I think that would have been the end of it except for the internet. Joe put out the word that I was making solotone mutes and now I have sold 34 of them. Are any instrument brands easier or more difficult to repair than others? I mostly like working on Bachs and Conns. Being able to get the parts is a big factor. With some brands, getting parts is impossible or sometimes the company is still in business but they don’t make it easy for us to get the parts. I think they would rather you just buy a new horn instead of fixing your old one. Getzen makes it easy to get most of their parts by just putting the entire parts list in the Allied catalog (they own Allied). I wish some of the others could be so easy. It is hard to get parts for the German instruments and anything from Besson or Boosey & Hawkes, so I guess they are my least favorite. The Chinese companies have not done much to help me get parts for their horns either. And some of the Chinese horns are of such low quality that you hate to see them come into the shop. Some shops refuse to work on them at all. For bass trombone and large bore tenor, I’m partial to Bach bells. There are a lot of good jazz horns being made now. I play Thayer valves on both my bass and large bore tenors. Rotary valves…you have to just try out the horn and see if it plays. I have played some great ones and a lot of terrible ones. I wouldn’t say any of the major manufacturers make a bad valve. I have played good rotary valve horns from almost all the manufacturers. Stick to one of the major brands, and try out as many horns as you can and pick out one that plays good. If you don’t play well enough to tell the difference, have a teacher or someone help you pick out a horn. Conn-Selmer seems to be trying hard to give good service. They have put the parts catalog on a web site and I can order anything I need right there, it even tells the quantity of each part that is in stock, so I like that. Getzen, as I said, is pretty easy to find what you need in the Allied catalog. I have had good luck with Kanstul getting a couple part that they make for a horn I was building. Most of the other companies, it is a mystery how we are supposed to order their parts. Bach cases are solid but heavy, and I wish they had not gone over to zippers in place of latches. I have seen that they have come out with a new case though that looks more like the old ones, so maybe this is an improvement there on the horns just coming out. Conn and King basically have the same cases, and they are all right. Yamaha has some good cases. Once you have destroyed your original case though (and I don’t know how the kids do it) what do you buy? I like the Eastman fiberglass cases very much, they are what I use, although the large bore tenor case will not fit a lot of the popular trombone models. Eastman is supposed to be coming out with some new, redesigned cases, but you never know how long it will take. I don’t like gig bags. I joke that they were invented by repair technicians to drum up more work. Along with marching band. Which job you have accepted has turned out to involve the most work? Building tubas. It’s pretty much impossible to charge for all the hours I spend. I had one guy who brought in a tuba and wanted pretty much all the body parts replaced. Except for the valve section and the bell, it was all new parts. Took over 20 hours to construct. What is the most common mistake made by young trombonists which may occasion them to visit your shop? Dropping the slide, a lot. Another thing that is showing up often these days is red rot. If you are not going to play the trombone for a period of weeks or months, then you should completely clean and dry the slide…swab out the outer slides with a cleaning rod and cloth and wipe off the inner slides…and put the horn in the case clean and dry. I have seen so many nice horns lately with bad red rod (evidenced by little pink spots on the outer slide tubes). This is the equivalent of rusting through from the inside out. It is so easy to prevent, just take a couple minutes to clean the slide and dry it out. It can completely ruin your outer slides and they will have to be replaced in order for the slide to work like new again. Do you recommend any lubricants? I like Trombotine because it cleans the slide and lubricates it. The others, stuff like Slide-O-Mix, does nothing to help clean the slide and it eventually dries and builds up on the slide. At some point it just doesn’t work anymore. What are your thoughts on the numerous offerings for trombonists today regarding valves? I play Thayers. I have played a little on some Greenhoes that played well and have played on a couple Hagmanns that were also OK. And as I said, some of the rotary valve horns can play great too, you just have to try them out and see how they play. 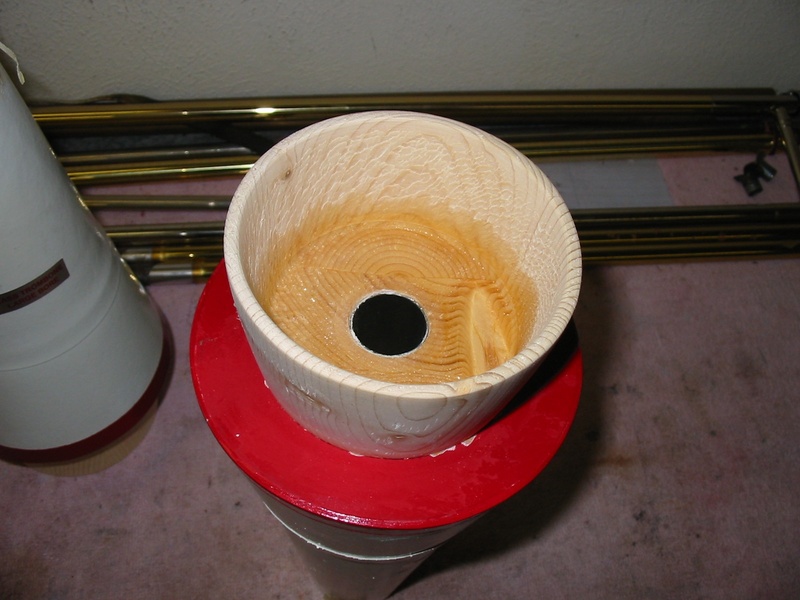 How do you tune your bass trombone valves? I use Bb-F-G-Eb tuning. I started out this way and never saw a reason to change. 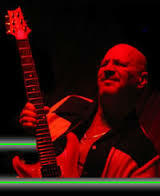 It is a little unusual because at least 90% of the guys use Bb-F-Gb-D tuning. I like some of the alternate positions that I have available with the second valve in my tuning and the horn is a little lighter because I’m carrying a little less tubing around all the time. I also thought that my horn at the time blew better without the D slide in it, so I chucked it into a drawer and left it there. I’m glad Edwards has finally made a bass trombone with Bb-F-G-Eb tuning as one of the options so more people can try it. Yamaha has usually made this option available on all their horns as well. The only drawback is that low B is out a little farther, like around 6th position or so, and low C is about 5th position instead of 4th.